When TED conferences took off in the early 1990s, the conversations the organization hosted tended to be technology forward, with a heavy splash of design. But the organization quickly grew into its motto, "ideas worth sharing," and today, TED talks and their independently produced regional variant, the TEDx, can be about almost anything. But expect Memphis to weave itself in and out of the narratives when TEDx returns to Memphis for its fourth consecutive year. It's setting up shop for a pair of sessions in Crosstown Arts Theater Saturday, February 2nd. 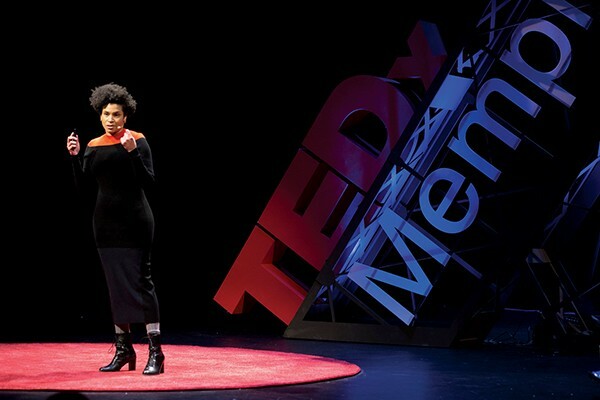 "Most of our speakers are local, so the ideas often have a particular relevance to Memphis," Memphis TEDx organizer and Executive Director Anna Mullins says. "But hopefully they have relevance outside the city limits." This year's TEDx theme is "ideas or the next century," and it is partly inspired by the city's bicentennial celebration. Mullins says that's, "just a big broad tent for forward-thinking talks that look at what's next for the city." Fewer than 20 speakers were selected from more that 250 applicants. This year's presenters include Hooks Institute director Daphene McFerren, who'll explore topics of artificial intelligence and automation and how they intersect with poverty and race relations. Other speakers include Alex Castle of Old Dominick Distillery, James Dukes of I Make Mad Beats, Playback Memphis founder Virginia Murphy, and Clayborn Temple director Anasa Troutman. "We don't just attract great speakers but also a great crowd of people who are inquisitive and ready to be challenged and inspired," Mullins says. "We want to make sure we're inviting everyone into the ideation space." For those who can't attend, the program will be live streamed at tedxmemphis.com.